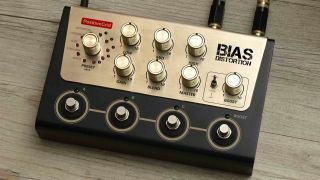 There are plenty of great distortion pedals on the market, but Positive Grid’s BIAS Distortion Pro is more flexible than most. Rather than simply giving you a fixed set of sounds to work with, this enables you to design your perfect pedal using the BIAS Pedal software. Transfer this over to the hardware and you’re good to go. Of course, the pedal also comes with some great distortion sounds that you can use right out of the box, but it’s when you start customising your tones that the fun really starts. You can share your sounds on the ToneCloud, where it’s also possible to download patches created by other users. If you want to be in with a chance of winning this delectable distortion, all you need to do is complete a short survey about recording that’s been put together by Focusrite. Whether you’re a beginner or a virtuoso guitarist - and whether you currently record or not - the company wants to hear from you.